Fergie at 25: A journey of belief, character and the hairdryer! A quarter of a century, a mighty long time period by any scale or measure that humans would ever design. Back then it was a sorry story for the club from Manchester that Sir Alex was going to correct. Back in those days Liverpool FC were the undisputed top dogs of English football and the only one’s who could challenge them were rivals Everton, a totalitarian Merseyside affair. Footballing success at the time looked tough for Sir Alex and United, never mind success in Europe or achieving knighthood for footballing affairs. Fast forward to the present day, 25 years gone by, Man Utd are undeniably the most successful club in the land, arguably the most supported club in the world and one of the world’s most valuable ‘brands’. And how times change, the real contenders for United are their city rivals Man City while the Merseysiders settle for lesser matters. Today is the day of accession that the king of Old Trafford first sat down with his responsibilities trying to plot the revival of a force in decline. After tearing down the dominance of Scotland’s Old Firm to shreds with Aberdeen, here he was with an unfashionable task to wake a giant from it’s slumber, to take United to safety at a time when United were struggling in the relegation zone. The task wasn’t easy, when Fergie arrived in Manchester, he found a game and a club that were stagnant, and through a commitment to style, zest and youthfulness, reinvigorated both during his long time on the side stretches of Old Trafford. The differences from the previous regime to the new one were immediate, gone were the cuddled up press meets that Ron Atkinson used to handle and replaced with intense, edgy ­gatherings that always threatened fireworks and on more than one occasion actually produced fireworks. Gone were the days of verbal tactics, only one man was incharge now who brought in tactics boards, a scouting revolution and a blueprint for ­unparallelled success in the years to come even though the results were’nt immediate. Three trophyless years followed Fergie’s arrival at the club and even though the club seemed to be on the up, sections of the fans were far from happy, some calling for his head having been disillusioned at the lack of markedly improved results in comparison to the old regime. 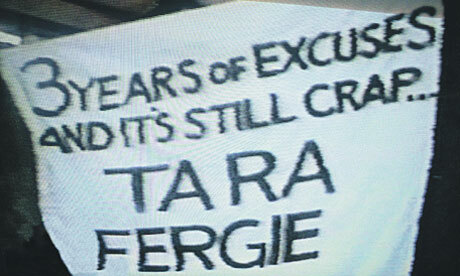 Legend has it that Sir Alex was close to the axe, having lost to Man City 5-1, the detractors were out in the open with their banners reading “Three years of excuses and it’s still crap…ta-ra Fergie” , journalists were doing their bit too. The crucial game that was going to decide his fate was the FA Cup 3rd round tie away to Nottingham Forest but somehow against the odds United won 1-0, Sir Alex survived to fight another day and as fate would have it, went on to win the FA Cup in the process, thus giving Fergie his first piece of silverware at United. Hindsight at times can be a wonderful thing, but had the wishes of those select fans come true back then, United’s dominance of the modern era of English football most likely would not have come to fruition, certainly not in this grand style as it has come under Sir Alex. Arguably that win against Nottingham Forest saved Alex Ferguson’s Old Trafford career. History they say is formed on those single moments of grandeur in time, and it is quite possible that the modern English game as we know it, as well as the contents of United’s trophy cabinet would have been remarkably different if United had lost that game in Nottingham and if Fergie had been shown the door. 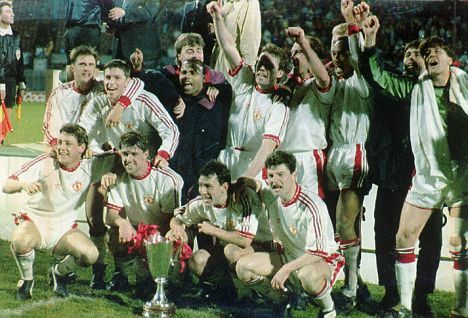 United players after winning the UEFA Cup Winner's Cup. Undoubtedly, the FA Cup victory settled the nerves of a lot of fans who no longer were on the edge regarding United’s failure to win silverware. Soon after, the UEFA Cup Winners Cup came to Old Trafford in what heralded the return of United to the bigtime but the bane of a section of United fans stayed, the club were still away from what was the holy grail at the time, the league title. Sir Alex publicly vowed to finally win the league after the Cup Winner’s Cup victory but next season after having led the table for a considerable time, they eventually lost out to bitter rivals Leeds, but United were certainly on the up. The drought of a league title had been long and arduous for a club that felt that they had been away from a league title for way too long after having seen bitter rivals Leeds and Liverpool winning it in the recent years gone by. Finally, in 1992-93 season with a squad that included newly acquired £1.2 million signing Eric Cantona from Leeds, Fergie achieved what so many United managers before him had failed to do for twenty six years, and guided Manchester United to a humungous winning margin of ten points for the newly renamed Premier League title, the first step of United’s climb to English football dominance. In the years since then, United have won a further 11 Premier League titles, four League Cups, five FA Cups and have been crowned the Champions of Europe and the World twice for a trophy count of 37 in 25 years. The proudest of those moments came at the Camp Nou against FC Bayern in the summer of 1999. United were probably the underdogs despite their heroic victory over Italian giants Juventus going into the game. At the end of this game, the European Cup will be only six feet away from you and you’ll not even able to touch it if we lose. And for many of you that will be the closest you will ever get. Don’t you dare come back in here without giving your all. -Sir Alex to his players before the final of UCL ’99. The game itself was witness to one of the most incredible conclusions to a modern football game, United had been slipping away from their ‘treble dreams’ as Bayern led 1-0 going into stoppage time. And that is when it all changed, two goals by Sheringham and Solskjaer off Beckham corners in stoppage time condemned Bayern to devastation and United into delirium. Just like how that Nottingham game was crucial to Fergie staying, this one was instrumental in cementing the Scot’s legendary status at the Theatre of Dreams. Another European triumph happened in 2008, although still encapsulated by the win of 1999. And then there’s the hat trick of titles between 2006 to 2009 which in part must be attributed to the squad, the way Ferguson has handled his players, showing on a number of occasions his strength of character to sell those players who disagree with him, no matter their importance, must not be overlooked. They key to Fergie’s success is that he’s been the boss all through, no matter who argues with him, it’s a dead end, for the player that is. United and Sir Alex have continued with their trophy haul and the greatest protagonist for the club has continued to be the wily old Scot himself. Under his watchful eye countless players like Scholes, Keane, Pallister, Beckham, Ferdinand, Cantona, Neville, van Nistelrooy, Cristiano Ronaldo, and Rooney have blossomed into world class talents with the world at their feet, put on centre stage for the fans to behold in appreciation for the stars that they became. Throughout the last 25 years Sir Alex has reformed and reshaped his squad and his tactics to fit in to tackle the challenges that he’s had at hand. He’s made the players, he’s made squad work and each of his doing has been different and each one has been brilliant. While time changes, Fergie has continued to stay as the only constant at the club. Despite his reputation as a disciplinarian, he fostered a team ethic that was strong enough to absorb quirky and headstrong individuals without losing its sense of purpose, and this aspect encapsulates his most conspicuous quality. He doesn’t accept mediocrity and the Fergie’s Hairdryer has been in action every time a performance fails to live up to the ‘United’ standard and fair to say, the hairdryer still functions well 25 years on. While one can argue that he does indeed have an ‘ego’, that he isn’t the most media friendly manager, that he does have a bad temper at times or that he likes to indulge in champagne socialism with fellow managers. But without doubt, he has always had the backing of his players that he has moulded over and over again as a team that fights together for a cause and without doubt the footballing world has been a better place with his presence, and that is a rare accolade . 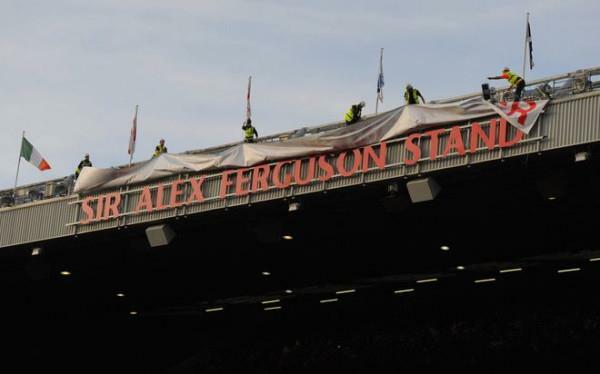 Old Trafford's North stand renamed in Sir Alex's honour. Suggestions have been made in the past and they continue to be made about Ferguson’s eventual successor, the man himself is far from finished and this is in own words- “I’ll continue as long as I feel healthy enough to do it, in management, things change as the years go on. It’s different now even to seven or eight years ago. A lot of things have changed. It’s been a bit of a fairytale to last so long and I appreciate that.“ The question about him calling it a day is a pointless one, with the noisy neighbours Manchester City ruffling United’s feathers these days and Barcelona dominating European shores, Sir Alex still has challenges aplenty and he certainly seems far from finished with his business. Twenty years ago, no body might have imagined a manager continuing to work at 70 but the way Sir Alex has gone on, it won’t be surprising that he goes on for quite a few more years, indeed until 75. When he leaves and how he leaves shall be on his own terms, in his own way and no body would probably ever dispute it. Dedicating a quarter of a century to the club, Sir Alex has pinned down his name as the club’s greatest hero. In ideal world, he should never leave United but given his age, it would be one of the saddest moments of every manc’s life whenever he does, but that moment is still a while away. In the meantime we can cherish his achievements, reflecting on how important he has been to Manchester United in moulding the club’s history and the only certainty in all this would be that United will never find another like him. Thank you Sir Alex for all of this and for everything more to come! 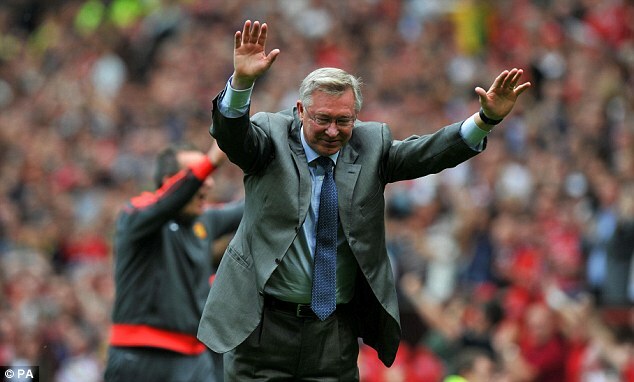 And to Sir Alex Ferguson, thank you for every little and massive things you did for us and may god always bless you. Thank you legendary Sir Alex, cant imagine a United side without him. And fantastically written piece man. The thing that stands out for the gaffer is that he has transformed and reformed his team to adjust to new challenges and no player has been bigger than the club no matter how huge in stature he might be, that’s what has been brilliant in him, not only is he a great man manager but also has kept a lid on his players and kept them going as a team to defeat the others. That is why he’s had the success he has had and is arguably the best ever. Absolutely true. His man management and ability to be a strong disciplianrian has resulted in part in his successes. He’s pivotal to United if we are to see of City in the near future. Upwards and onwards gaffer!